MTG Commander/Elder Dragon Highlander • View topic - Oath of the Gatewatch -- The Colorless Basic Land is Here! Oath of the Gatewatch -- The Colorless Basic Land is Here! Post subject: Oath of the Gatewatch -- The Colorless Basic Land is Here! A basic land, with no basic land type, which produces colorless mana. Just what Karn's been looking for! 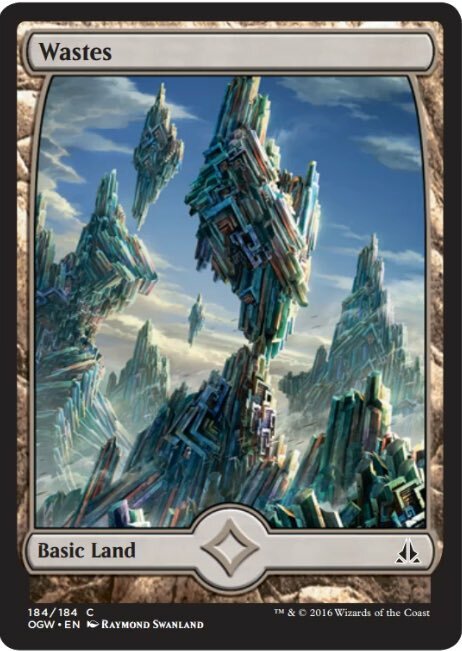 Post subject: Re: Oath of the Gatewatch -- The Colorless Basic Land is Here! Also I'm really curious how the new mana symbol works. I suspect it will be just like Snow mana. Except instead of implicitly tying it to a supertype, they are just making it explicit on the card. (If you played any Coldsnap limited, you will know the snow mana symbol could be bit confusing.) I suspect it will have some name like "Void Mana" or "Raw Mana" or "Primal Mana" and be used only by Eldrazi and created by Eldrazi and their associated lands. Wastes will be in the common slot, rather than the land slot. It's also interesting that they decided not to increase the Domain count to 6. And I suspect this will not increase radiance counts. Interesting, it does seem like a new spin on snow mana. I am not looking forward to opening Wastes instead of any other full-art basic land though, assuming Oath will have them. It's "must be paid with colorless mana," not a new parasitic type of mana specific to only this set. Nice to finally see a colorless basic. 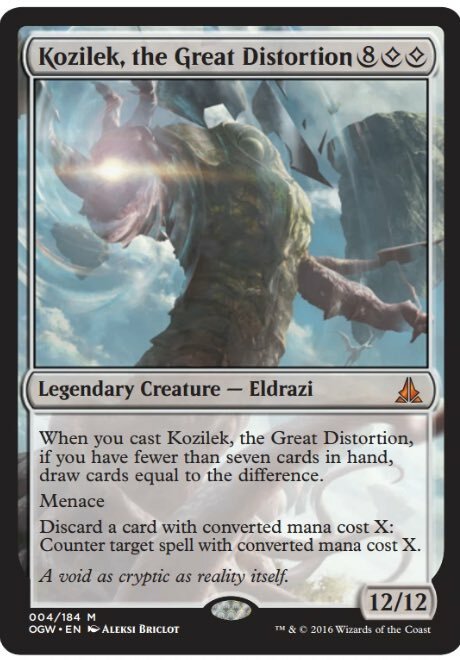 I am however pretty bummed at Kozilek's crappy art. Definitely my favorite of the three titans because of his original art. The lack of detail is depressing. 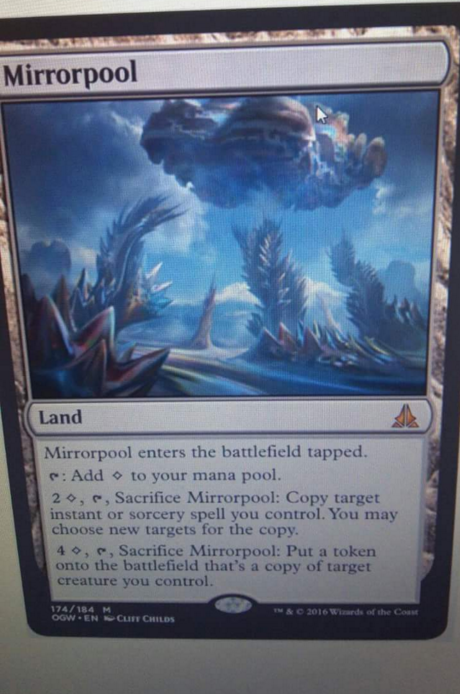 That doesn't make sense for Mirrorpool though. You wouldn't tap to produce "must be paid with colorless mana." It would be really strange if they just decided that generic mana production gets a new symbol in the middle of a block. If they were going to do this, I would have expected the symbol to show up on Shrine of the Forsaken Gods just like Eye of Ugin was printed before the Eldrazi. That doesn't make sense for Mirrorpool though. Or for Wastes, for that matter. Well, it makes a bit more sense on a basic, since that isn't rules text. It's just a visual reminder of what the land does. You wouldn't want the (1) symbol there. It's weird that they would use the symbol that way, yes, but it's very implausible that this is actually a new type of mana. It would be very difficult to support this mechanic in just a small set if you only had a select few cards from that set to generate the mana, while if it's colorless it's already well-supported and integrated with BFZ -- all the stuff like Kozilek's Channeler and whatnot supports the mechanic. It's not exactly a new type of mana when produced. So far what we know is that it's figuratively (1) when produced. What I'm interested in knowing is if the Urza Tron produces (1,2,3) or (*,**,***) when tapped. This may not work depending on how well they flesh it out. Does Wastes produce (1) or a single ¤? Mirrorpool requires 2¤ & 4¤ for the abilities so I'm guessing the 2¤ must be paid with one Wastes style mana (like Snow) and the remaining with any colour including ¤ and colourless? It has to work like Snow if they are adding payment requirements to other cards. They can't retrofit an entire type of mana to become ¤!! What would Sol Ring produce if they did: ¤ ¤ ?! Snow mana is a property acquired through the supertype. What I think is that the new mana symbol works kind of the same with the Basic supertype. It may be the symbol for Basic mana; and the Wastes cards would produce one colorless Basic mana. Then I suppose mana produced by existing Basic lands (such as Forest) could also be used to pay for Basic mana in costs. The whole thing is too fishy for me to buy into it just yet. 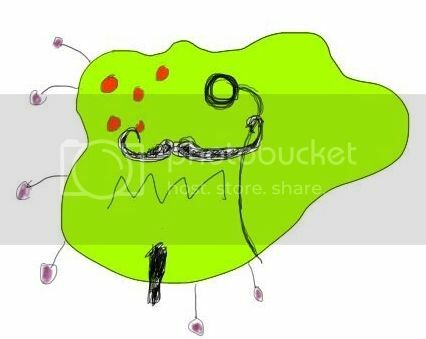 Instead of trying to figure out how it would work, I think the community should focus more on if it is a real leak.